INDIAN OVEN RESTAURANT Our upstairs room is now always open for private parties & intimate dining. Come and look at the new hand-painted mural inside our restaurant. 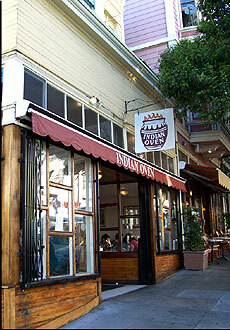 Since 1988 Indian Oven Restaurant has served San Francisco some of the most creative and flavorful cuisine to the delight of our loyal patrons. We invite you to join us in our bright and comfortable dining room or order ahead for take out or delivery to your home or business. We offer full catering services and complete banquet facilities for simple gatherings to elegant affairs. Also consider us for birthday parties, wedding receptions and corporate events. For larger parties and get-togethers where you have special requirements, contact us to discuss your needs. Our experienced chef's from India make our dishes fresh in our open view kitchen and cooked to perfection using centuries old traditional methods including the use of the clay oven (tandoori) fired up to 1000 degrees.